Truffle is an earth fruit which has ancient origins and it’s is known as food of Goods. Truffle is the name of the fruit body of a subterranean fungus (hypogeum), which belongs to the class of Ascomycetes, that lives in mycorrhizal symbiosis with some plants, both arboreal and shrub-like. Infact truffle grows close the trees roots like: poplar, oak, willow, linden etc. Furthermore, the same trees influence its colour, taste and its smell. Their shape is linked to the type of ground while their growing to environmental and seasonal factors. Italy, thanks to its stone and mineral characteristics of its territory is one of the biggest producers of quality truffles and the most common species are: the white truffle, the light white truffle, the summer truffle, the fine black truffle, the winter black truffle and the smooth black one. It is a very fine and valued food. Its typical penetrating and persistent smell can develop just after its complete maturation and it’s like that in order to attract wild animals like pig, boar, badger, dormouse and fox, in this way they can spread its spores and it can keep the species up. 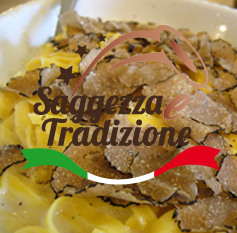 “Saggezza e Tradizione” is a Company specialized in selecting and marketing the best truffles, fresh and frozen and other truffle-based products only from Italian origin, ensuring its maximum freshness, the high quality of the product, and a good value for money reserve to our final clients, who can receive their products in short time.